a. Inspect for cracks in welds around Magazine Sleeve (26) both sides. b. Inspect for cracked, bent or missing Handguard Tab (27). 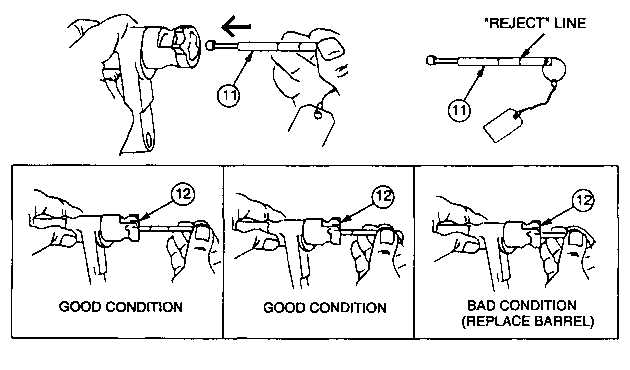 c. Inspect for cracked or broken Sling Holes (28), both sides. d. Inspect for cracks in welds of gas cylinder support, both sides. e. Inspect for cracks in the rear radii of the trigger mechanism slot on the bottom of the receiver. 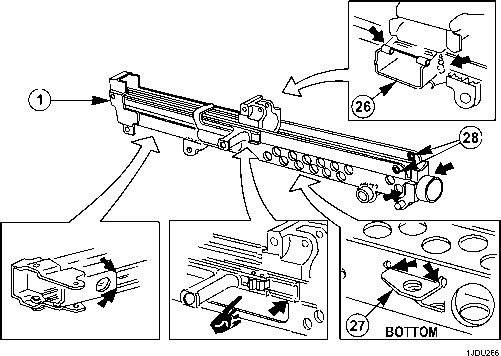 f. Inspect for cracks in the upper front radius of the ejection port cut out. g. Inspect for elongation and cracks of the take down pin hole in the inner rail, at the rear of the receiver, both sides. 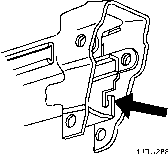 h. Inspect for cracked or bent transfer mechanism assembly catches/hooks inside of the receiver, both sides. i. Inspect for cracks in the radii (just forward of the stop) of the cocking handle channel. a. Inspect for bent pivot pin/trigger mechanism flanges on bottom rear of receiver, both sides. b. Using the slide assembly from the weapon (minus the bolt and piston assemblies), install in rear of the receiver and slide the entire distance of the rails. If binding is detected, it must be assumed that the receiver is bent or the rails are damaged.